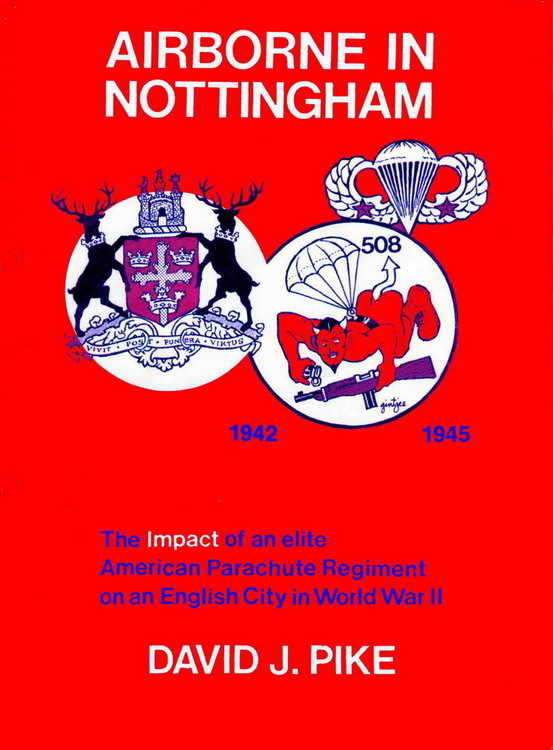 Written by Nottingham native, David Pike, this limited edition book is no longer in print. Many of you have asked for it and now it is available. With the kind permission of its author, we have painstakingly reproduced it here in 'e-book' format for your enjoyment. From its FOREWORD written by the 508th's inimitable O.B. Hill through the the various stories contributed by a number of 508th veterans, a clear and intriguing tale is told. Captured her is the tale of the 609th's arrival at Nottingham's Victoria Station after having endured nearly 24 hours of transition. First it was a train from Portstewart to Belfast, then a ship to Glasgow followed by still another train into 'Robin Hood Country'. The men arrived groggy and weary and suffered through a short night filled with noises as the camp in Wollaton park was getting settled. You'll chuckle at the impressions first received as the men awoke to a foggy reveille call and stumbled out of their tents into formation. and truly laugh at a few events that immediately follow.. But most importantly, you will witness the mutual love and admiration held by the citizenry of Nottingham and the men of the 508th. It is a love affair that began in March of 1944 and endures to this day.